I have been out looking at plenty of fields in early April and counting tillers. Most of the fields I checked had between 1350 and 1800 tillers/yd. 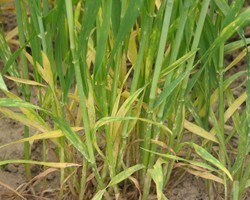 There are plenty of healthy plants and tillers out there. My recommendation on these fields was to hold off on applying N at green-up and apply it all at jointing. I know it is hard to wait if the current field conditions are perfect for spraying! This later N application timing should coincide with stem elongation which means nitrogen is going towards increasing the number of seeds per head and seed size, not additional tillers. Wheat takes off quickly at this stage so be diligent and prepared to spray. Weeds. We continue to encourage the earliest planted fields to be sprayed for winter annual weeds (purple deadnettle, chickweed, chamomile) in late fall. You never know what the weather will be like in the spring and timely weed control can be tricky. Right now the earliest planted fields should have been sprayed for weeds already. Some of the later planted fields may still need to be sprayed. We are still encouraging that you do not mix your herbicide and nitrogen applications and spray separately. The leaf burning can cost use up to 10 bushels and could get worse as temperatures increase. Insect Scouting. Cereal leaf beetles will be emerging as the weather warms and will be hungry and looking for a host to lay its eggs. Its first choice is usually oats but there may not be enough acres emerged yet and wheat would be its second choice. Economic threshold for insecticide treatment is three or more eggs and larvae per stem before the boot stage. Threshold decreases to one larva per stem after flag leaf emergence. Most wheat producers have not forgotten about the "Armyworm Invasion" of last year. Armyworms do not overwinter in NY so there no way to determine if they will have a repeat performance. We will be watching for adult flights earlier this year and combing through the lower wheat canopy for small larvae. Remember, armyworms are nocturnal feeders so scouting with a flashlight at night could reveal this daytime hider.